Boyka returns to break more bones in this super-charged sequel. He turns from zero to hero as he slowly recovers from his leg being snapped by Michael Jai White at the end of the previous movie. Reduced to a hermit-like existence in a Russian jail with no chance of parole, he steps back into the world of organised prison fighting (it’s a thing) and is marched off to Georgia at the behest of some rich fixers who run a high-stakes international fight tournament. Prisoners are recruited from all corners of the globe in shades of Van Damme‘s The Quest, with the losers being sent away and executed. In their spare time, the prisoners are kept busy breaking rocks and getting their muscles all wet and shiny. 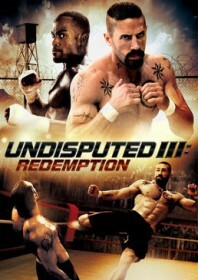 If anyone can add extra dimensions to a murderous thug like Boyka, then it’s the charming Scott Adkins, who provides the inmate with a sympathetic, human side via a brewing bromance with his fellow inmate and work-out buddy, Turbo (Mykel Shannon Jenkins). Their bond becomes quite touching: Boyka suffers from an inferiority complex regarding his injured knee, so Turbo gives him some flowers to ease the pain. The pleasantries don’t extend to the boxing ring, however, which is the setting for Boyka’s inevitable throw-down with a massive, jacked-up Colombian dude. The low-budget eastern European locations, odd dubbed moments and array of accents gives the film a strange Euro-pudding quality. Adkins saves it, imbuing his felon with feeling and relishing every opportunity to kick heads in an increasingly elaborate series of bewildering contortions.